It’s hard to believe that prices this summer were the highest since 2014. We’ve had nearly four years of low gasoline prices … or what feels low. However, based on the oil price, we’re paying more for gasoline now, on a relative basis, than we did back in 2008. In theory, that ratio shouldn’t change much. 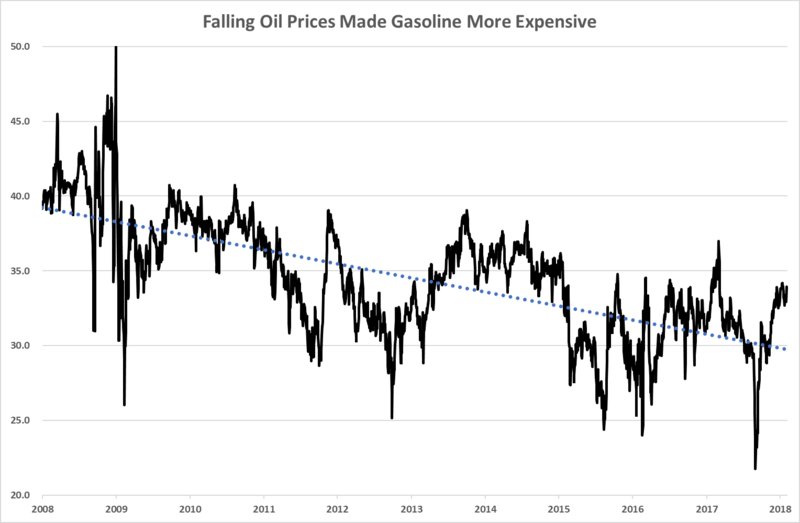 However, as you can see from the chart below, something isn’t right with the gasoline price. As oil prices fell from 2008 to the present, the price of gasoline got more expensive relative to the price of oil. The chart above uses West Texas Intermediate oil prices and East Coast (New York) regular gasoline prices. You can see there is a definite trend down from left to right. That means gasoline got more expensive relative to the oil price. When oil prices soar, refiners have a hard time making gasoline at a profit. That’s because as gasoline prices rise, consumers conserve. However, as oil prices fell into 2016, refiners made up ground by gouging consumers. They charged more for gasoline … sending the ratio down and profits up. Giant oil refiner Valero Energy Corp. (NYSE: VLO) saw its revenue fall from $113 billion in 2008 to $63 billion in 2009. From 2013 to 2015, as prices fell, Valero’s earnings grew from $5.7 billion to $8.2 billion. That was a 44% increase in profit, even as oil prices collapsed from $100 to $30 per barrel. Today, we’re seeing something similar happening. As oil prices contract down from a recent high of $66 to $60 and lower, we can expect to see gasoline prices move downward more slowly. That means refiners will probably do well this year. The VanEck Vectors Oil Refiners ETF (NYSE: CRAK) is up 63% from its low in 2016. However, the sector should continue to do well. And the recent pullback makes the refining complex look attractive today. If you want to put money to work in oil without direct exposure to the oil price, that’s a good choice today.